A holiday in Rimini? Fun is everywhere, for everyone and at any time of the day. Do you dream of relaxation under the umbrella or do you want an active holiday? On the seashore await establishments designed to pamper you from morning to night. There are beaches for those who love the sweet doing nothing and for those seeking total well-being. The beaches with animations, games and entertainment and those for four-pawed guests. On the sand you can deepen your energies with zumba, beach volleyball, beach soccer and beach tennis. 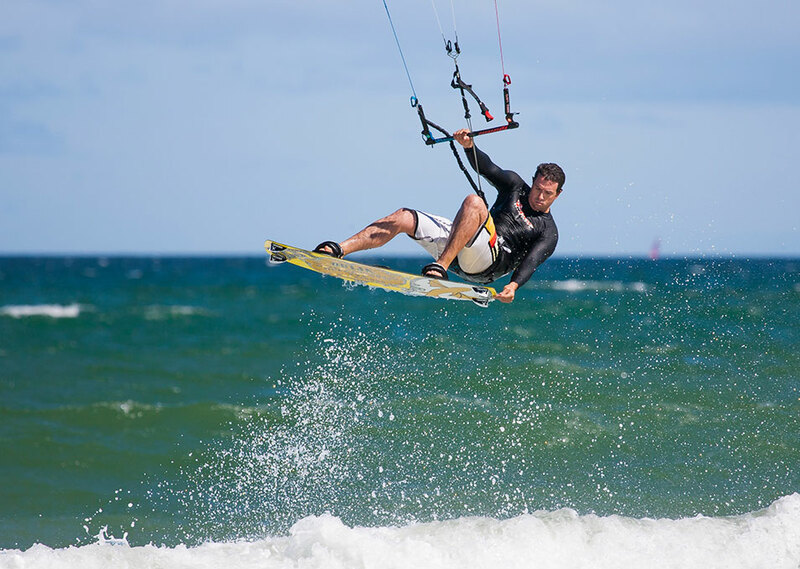 You can ride the waves with kitesurfing or windsurfing or you can sail off on a boat trip. The best way to end the day? An aperitif at sunset, in one of the many kiosks on the beach, waiting for the night to light up. Smart Beach. With our beach service, you can reserve your place under the umbrella at the hotel, effortlessly and at affordable prices. Convenient, right? In the city, it is worth starting the evening with a walk along Viale Vespucci, the Rimini promenade par excellence. Along this road, parallel to the promenade, the windows of the most fashionable shops and the signs of the restaurants, pubs and clubs of the Rimini by night sparkle. For true romantics, we recommend a night ride on the Ferris wheel: from the height of its 55 meters, the lights of the city shine like many little stars. The longest night of the year? Obviously it is the Pink Night, a long weekend of shows, concerts and fireworks to illuminate the summer of the Riviera. 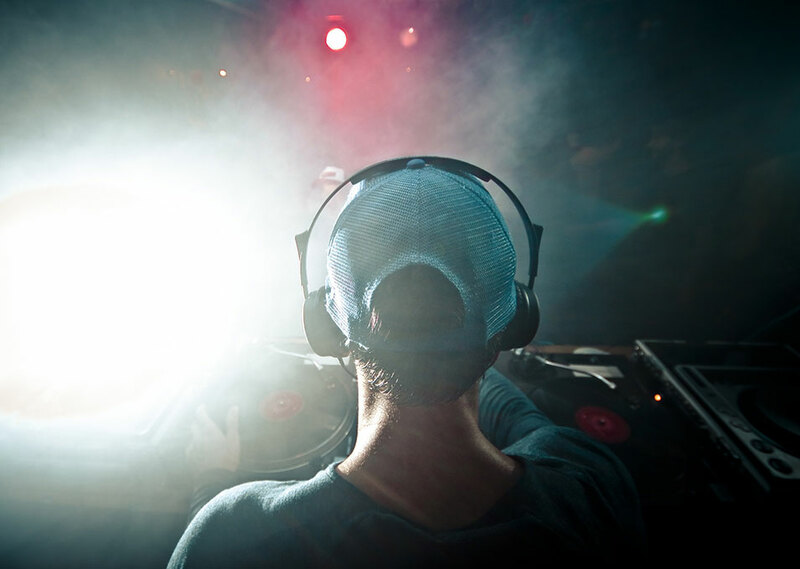 The best clubs to dance and have fun from dusk to dawn are at your fingertips. Some names? Altromondo, Carnaby, Coconuts, Rock Island and Mon Amour are the most famous clubs in town. Nearby, Pascià, Villa delle Rose, Peter Pan, Baia Imperiale and Cocoricò. Disco Smart. On request, we reserve your evening in the most exclusive clubs of the Riviera, with pre-sales or table reservations. The largest amusement park in Europe? 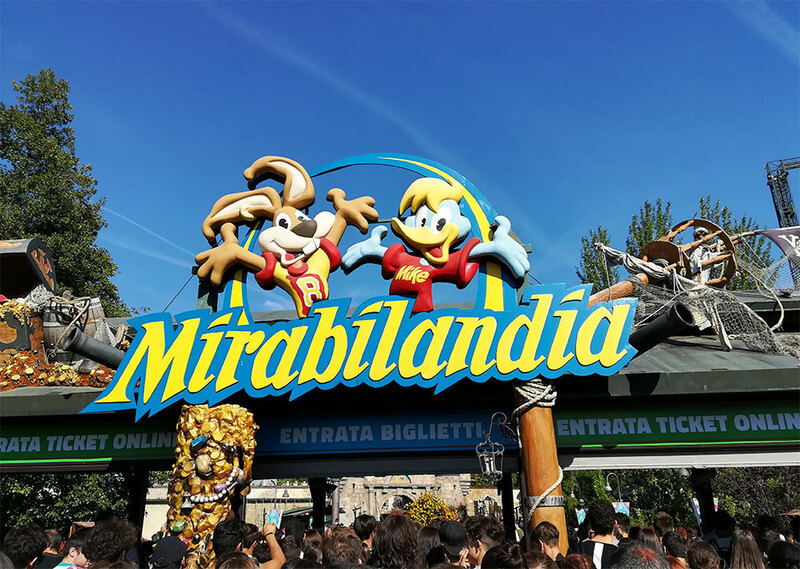 It is Mirabilandia, just over 30 minutes drive from Rimini. It has dozens of themed attractions and on water, to the delight of young and old. In Rimini, Fiabilandia awaits you, a favorite among families with children, and Italia in Miniatura, the park with more than 270 scale reproductions of Italian monuments, churches, palaces and squares. Do not miss the Rivergreen Golf, the first eco-golf course in Italy by the sea. The largest aquarium in the Adriatic? It is the Aquarium of Cattolica: it has more than 100 tanks with sharks, penguins, turtles and tropical fish. For those who love excitement and adrenaline, the Aquafan Riccione is the right destination. For a face to face encounter with the dolphins, take a trip to Oltremare, the theme park dedicated to the animals of the oceans. Smart Parks. Want to treat yourself to a day of pure fun? In our hotels you can buy tickets for Mirabilandia and other parks on the coast. The oldest existing Roman arch? 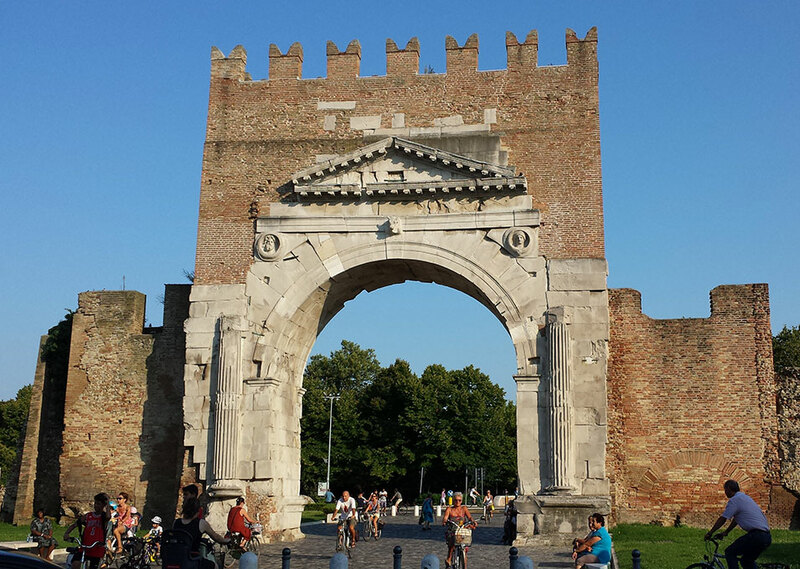 You can find it in Rimini: it is the Arch of Augustus, built in 27 BC. Today it is one of the two symbols of the city, together with the Tiberius Bridge, at the other end of the city. The heart of Rimini is Piazza Tre Martiri, an ancient forum and a cross between cardo and decumanus. In this square stands the Clock Tower. The oldest Rimini rests also in the remains of the Roman Amphitheater and the Domus del Chirurgo, an archaeological museum set up in the spaces once belonged to a residence of a doctor of the second century AD. More to see? Of course! The Tempio Malatestiano is the cathedral of the city, built in the fifteenth century on a project by Leon Battista Alberti – it preserves works by Piero della Francesca, Giotto and Vasari. The real inhabitants of Rimini meet at the Pigna, the fountain of Piazza Cavour. A few steps away, you will find the Old Fish Market, one of the favorite meeting places for young people: nearby, restaurants, wineries and pubs, all good for a tasty stop. The grand finale is Castel Sismondo, fortress of the fifteenth century, today home to art exhibitions, events and presentations. 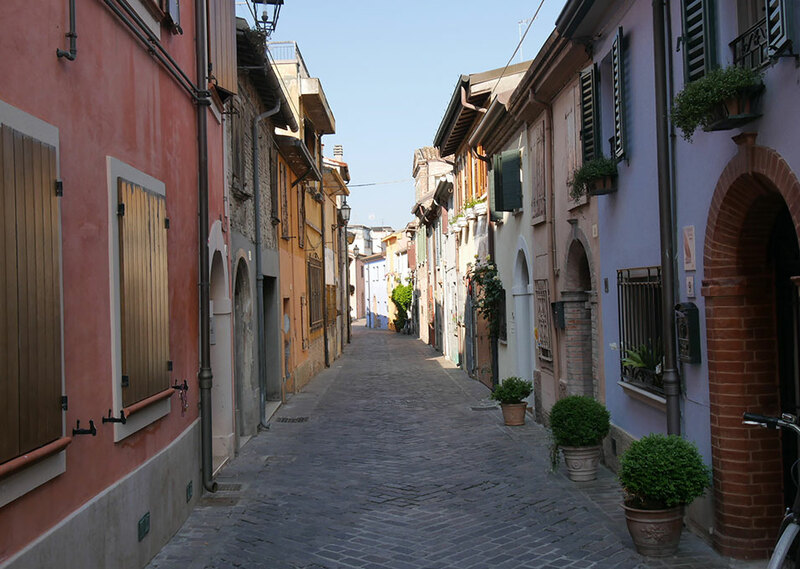 Just beyond the Marecchia is Borgo San Giuliano, a corner of Rimini that has been able to preserve the charm of a real country of other times. The merit of its interweaving of narrow streets and squares, which overlook old taverns and cellars transformed into typical trattorias. Among the houses of the Borgo are murales dedicated to Fellini's films. Not by chance, because it was in these alleys that the director loved to walk in search of inspiration for his next screenplay. Federico Fellini was born January 20, 1920 in a small pink house in Via Dardanelli, just behind the skyscraper - still exists, near the civic 10. The other Fellini places in the city are the Grand Hotel, “the fairytale world of the rich and luxury”, which Fellini immortalized in his Amarcord, and the Cinema Fulgor, at 162 Corso d'Augusto: in this room, the future director saw his first film, Maciste all'inferno, sitting on his father's lap. If you want to forget beach and umbrellas, at least for a day, we suggest a route among the beauties of the Rimini inland. Start from Santarcangelo di Romagna, a pretty medieval village perched on a hill and home of the blood-red Sangiovese. Among the small houses, food shops and trattorias, the Museo del Bottone is the first and only one of its kind in Italy. 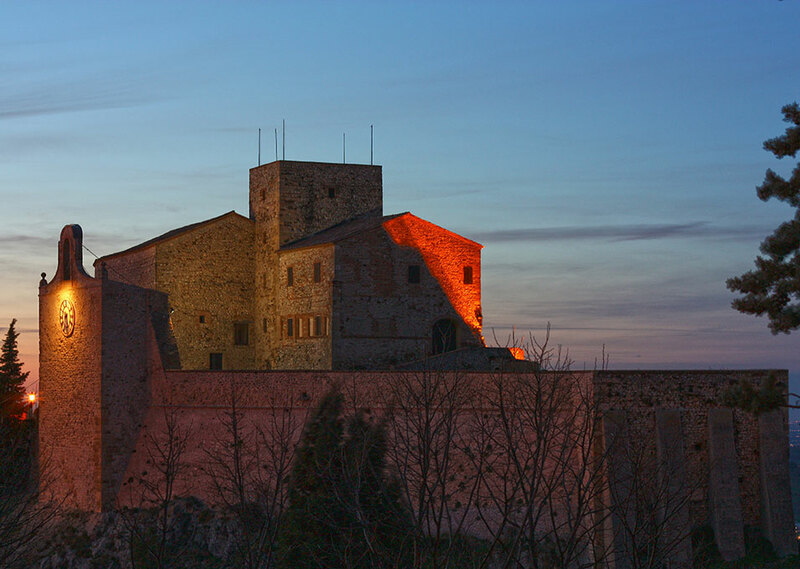 Further on is Verucchio, dominated by the Malatesta Fortress. Between August and September, the country hosts the Feasts of the Malatesta, with parades, banquets, court dinners, rides of knights and arms. If you keep going up the Valmarecchia, you come across San Leo, the small capital of Montefeltro. From the top of the village, dominated by the Fort, the view embraces the valley, as well as San Marino - a few minutes away - and the sea. In Upper Valmarecchia stands Pennabilli, the small town chosen by the poet Tonino Guerra as his residence - he created l’Orto dei frutti dimenticati, a gracious museum of flavors.